At present, 52% of US women think the world would be better if women were in charge, according to data from YouGov Profiles. Three in four don&apos;t think men and women are treated equally in the workplace. Add these to the fact that 60% of American women report being sexually harassed by a man at some point in their life, and it’s easy to see why the #MeToo movement has gained so much momentum. One brand that has found itself caught up in the #MeToo moment is the lingerie chain Victoria’s Secret. Some have wondered if it’s time for the brand’s annual fashion show, which features women walking the runway in expensive undergarments, to call it quits. Last month, Victoria’s Secret model Karlie Kloss defended the event, arguing that it’s relevant for today’s world. “There’s something really powerful about a woman who owns her sexuality and is in charge,” she said. Consumers might not agree: last year’s Victoria&apos;s Secret Fashion show, which aired just over a month after allegations of sexual harassment and worse began surfacing around Harvey Weinstein, saw television ratings sink 30%, hitting a new low for the broadcast. 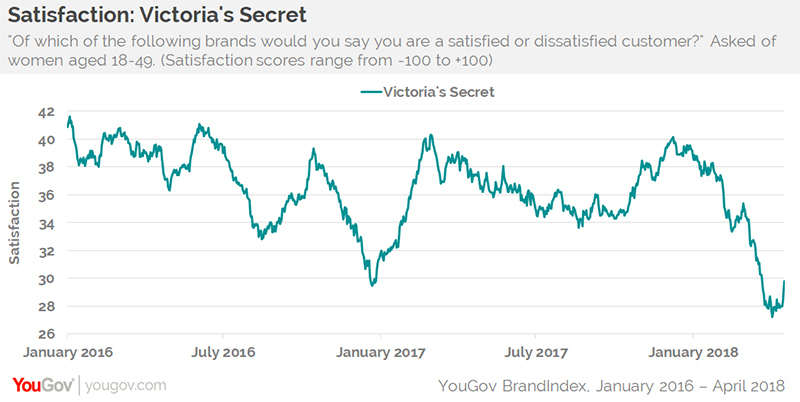 According to the latest data from YouGov BrandIndex, Victoria’s Secret’s Buzz score – which measures whether consumers are hearing positive or negative things about a particular brand through news, advertising, or friends and family – has been declining with women aged 18-49. After reaching a high score of 31 in early 2016, the lingerie brand is currently down to 23 among that demographic. Beyond public perception, Victoria’s Secret is also facing challenges with sales. 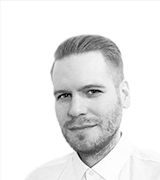 YouGov data shows that fewer women aged 18-49 report buying from the brand now than have done so since 2013. In its latest annual earnings report, released last February, parent company L Brands, Inc. revealed declining sales for Victoria’s Secret compared to the previous fiscal year. 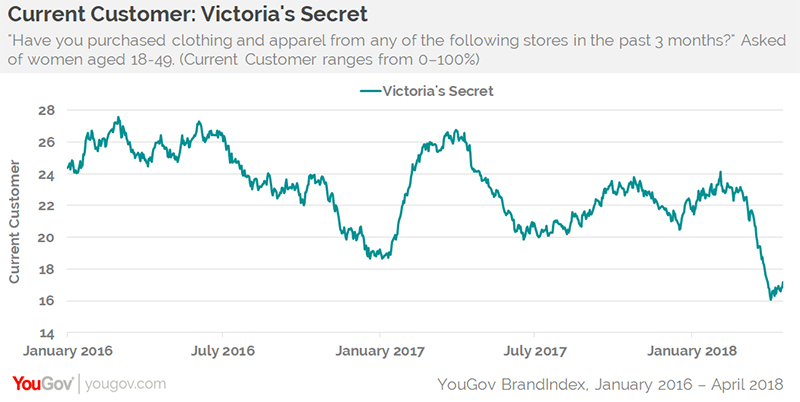 Even with 18- to 49-year-old women who do shop at Victoria’s Secret, things aren’t looking good for the chain. While more remain satisfied with the brand than dissatisfied, that number has decreased to a low unseen since 2013. On a positive note, more US women aged 18-49 say they&apos;d be proud to work for Victoria&apos;s Secret than embarrassed, while one-third presently express an openness to shopping there when next in the market for clothing and apparel. Overall, 60% of female Victoria’s Secret customers aged 18-49 believe the world would be better if women were in charge. Furthermore, 79% like when companies have a moral message, compared to 67% of the general public.